Online Data: Christmas Day uniforms are now available for the Chicago Bulls, Boston Celtics, L.A. Clippers, Miami Heat, New York Knicks, L.A. Lakers, Brooklyn Nets, Denver Nuggets, Houston Rockets and OKC Thunder. Check them out in-game! 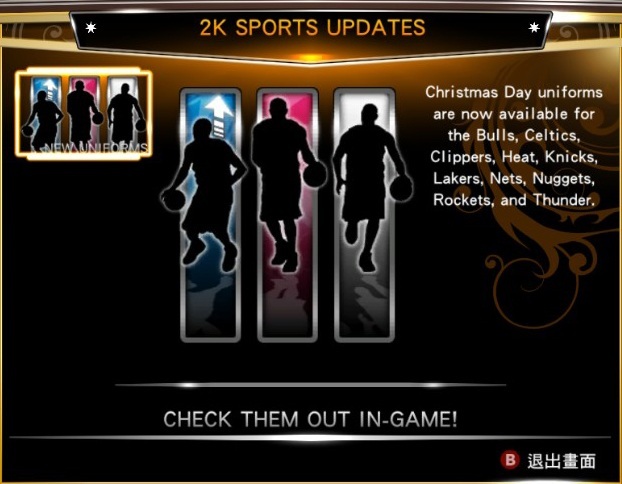 Description: NBA 2K13 released a new roster update that will add the Xmas jerseys in-game. The new roster update will also update the player ratings and the number of players missing from the NBA 2K13 roster is now down to 13. 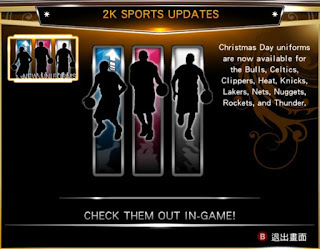 Note: The PC version does not include the files for the X-mas jerseys & the Miami Heat's White Hot alternate uniform so the jerseys will appear white in the game, however those are already unlocked in the roster which means you can install jersey mods without having to replace original uniforms. Ratings: Andrew Bynum -13 to 71, Tyrus Thomas -12 to 59, Beno Udrih -8 to 60, Derek Rose -32 to 60, Rip Hamilton -11 to 62, Kyrie Irving -10 to 75, Avery Bradley -12 to 67, Grant Hill -11 to 66, Chauncey Billups -13 to 68, Trey Thompkins -11 to 52, Eric Gordon -12 to 72, Raja Bell -11 to 60, Iman Shupert -26 to 54, Amare Stoudemire -12 to 71, Steve Nash -14 to 73, Pau Gasol -5 to 76, Steve Blake -5 to 63, Al Harrington -11 to 60, Hedo Turkoglu -11 to 61, Dirk Nowitzki -11 to 73, Brook Lopez -12 to 68, Wilson Chandler -5 to 75, Jeff Pendergraph -10 to 52, Danny Granger -5 to 78, Alan Anderson -11 to 55, Landry Fields -6 to 67, Royce White -11 to 57, Stephen Jackson -9 to 69, Channing Frye -10 to 57, Brandon Roy -12 to 68, Chase Budinger -11 to 60, Ricky Rubio -28 to 50, Elliot Williams -21 to 45, Victor Claver -6 to 56, Richard Jefferson -12 to 62, Andrew Bogut -29 to 50, Brandon Rush -25 to 46, Trevor Booker -10 to 57, Trevor Ariza -12 to 64, John Wall -14 to 68. XBOX 360 & PS3 - All official roster updates for the console version will automatically download and install if its connected to the Internet. Note: Replace "USER" with your own windows username. To use: Go to NBA 2K13 Menu > Options > Load & Save > Load > Load Roster.